Imagine the Moon up close and personal and in high def to boot. That's the hook of a new book coauthored by the director of the Center for Educational Technologies who provided the words to accompany magnificent high definition pictures of the Moon's surface taken by a Japanese spacecraft. Dr. Charles A. 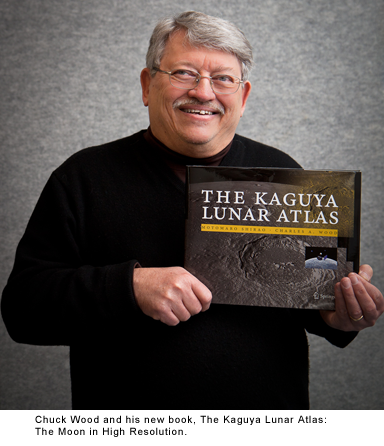 "Chuck" Wood, a renowned expert on the Moon's geology, joined Motomaro Shirao, who worked with the Japanese Space Exploration Agency (JAXA), in writing The Kaguya Lunar Atlas: The Moon in High Resolution. The 184-page hardcover version of the book was released this month through Springer Press and is available for $23.48 through Amazon. In late 2007 JAXA placed the Kaguya/Selene spacecraft in orbit around the Moon to probe the Moon's surface and interior. But unlike previous lunar orbiters, Kaguya carried a high definition television (HDTV) camera sent beyond Earth orbit. Sponsored by the Japanese NHK TV network, the HDTV amazed both scientists and the public with its stunning views of the lunar surface. What makes these images so much more engaging than standard vertical view lunar photography is that they were taken looking obliquely along the flight path. "There were two HDTVs—one pointing forward, looking where the spacecraft was going, and the other pointing behind it at where it had been," Wood explained. "Most cameras on lunar orbiters have looked straight down. The oblique views of the HDTV provide that 'astronaut-at-the-porthole' perspective. It's much more dramatic than a vertical view." Wood was approached by Shirao to provide content for the book thanks to a simple laminated card Wood had created to help backyard astronomers. "I had published the Lunar 100 Card, which was a laminated card showing the Moon and listing 100 objects I selected as being geologically interesting for amateur astronomers to observe with their backyard telescopes," Wood said. "That list was used by the Japanese to help select objects for their HDTV to image, and they asked me for a list of far side targets too. When the mission was over, I was surprised and pleased to be asked to coauthor a book on the best photos taken." Each page of the atlas features an HDTV image with a map of the entire Moon in an upper corner showing where the image is located. A 100-150 word description accompanies each image. As the book's jacket notes, "Seeing the Moon is not intended solely for lunar scientists who are striving to work out the mysteries of the Moon's origin and evolution. Everyone can appreciate the natural beauty and be entranced by the view of the nearby world where humans may one day live." In addition to his work leading the Center for Educational Technologies, Wood serves as a senior scientist with the Planetary Science Institute in Tucson, AZ. Wood also chairs the Lunar Nomenclature Task Group of the International Astronomical Union, which issues new names for features on the Moon. Wood has authored three other books dealing with the Moon, volcanoes, and impact craters. He also has written some 250 other publications, including scientific papers, conference reports, and abstracts for oral presentations at national and international meetings. Wood has been a columnist for Sky & Telescope magazine since 1998, authoring more than 150 columns. In addition, he operates the websites Lunar Photo of the Day and The Moon Wiki. As chief of NASA's Space Shuttle Earth Observations Office from 1985 to 1990, Wood trained astronauts in what to look for while observing the Moon and Earth from space.